That would all depend on how much you like the car, the condition and miles and what the transmission costs. I would agree. If the overall car is in good shape and the engine runs good then yes. I would rather spend $1000-4000 one time then have a $400-500 car pymt for 4-5 yrs, but that is me. Does a 2001 QX4 Infinity have vacuum lines hooked to the transmission? 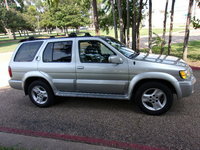 I have a 2001 infiniti qx4 will a transmission from a 2001 pathfinder fit it ? Start a new INFINITI QX4 question. Looking for a Used QX4 in your area? CarGurus has 5 nationwide QX4 listings starting at $5,990.